About Simon B. Message Simon B.
Simon was a very professional driver and had organised an excellent tour with experienced guides, Giusi and Rosanna in Villa Romana del Casale and Noto respectively. We had an excellent and enjoyable day and a good lunch. Simon took good care of two ageing travellers. Would definitely recommend his services to others. We had a wonderful experience touring with Simone. He is an excellent and knowledgeable guide. We visited Taormina and Castelmola and it was an amazing experience. We highly recommend him as he will make your experience a truly memorable one. We had a great day with Simon who was very attentive to our enjoyment of the day. The wineries were very interesting if your into to that sort of thing, which we are. The wines we tasted were very good. We had to miss out Catania as the weather was shocking by then but Simon made every effort to make sure we were fully happy with his suggested alternative. He is very easy to be with and has an excellent knowledge of the area. Simon was an excellent driver, taking us from the port of Messina to Roccella Valdomone (a small town about 90 minutes away in search of Italian relatives) He also took us to a picturesque spot along the Alcantara River. Simon was great at communicating with the town people though we did not find any family. Then he took us to Taormina to walk along a beautiful beach and to a lovely cliff side restaurant overlooking the beach. And he has a luxurious Mercedes sedan. Highly recommend Simon. He is very friendly, knowledgeable and his English is excellent. You will have a great time with him! Hire Simone for a memorable trip to Sicily! You won't be sorry! 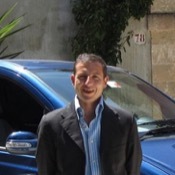 He is punctual, caring, and enthusiastic and tries his best to make his clients see the Sicily he loves! I am encouraging my friends to hire Simone to be their driver for a trip to Sicily. He is extremely knowledgeable, helpful, willing to go above and beyond the job to ensure the clients learn everything about Sicily! Simoni was our driver for our entire trip to Sicily. He was simply outstanding! He wanted us to have the best trip possible and encouraged us to see everything. It is obvious that he loves what he does and he is a joy to be around. I can't recommend him highly enough! Simon created an excellent and informative tour. He is extremely knowledgeable about both Sicily and the specific areas we visited, and his communication skills are excellent. He also chose two amazing tour guides for the visits to Agrigenta and the Roman mosaics at Piazza Armerina. Simon was punctual and he drives a luxury car. Everything was exactly as we had hoped. We recommend him with great enthusiasm. Simon exceeded our expectations. He was there when we arrived, his English was very good and his knowledge the island was impressive. He took us to coastal villages with great views of the coast. Excellent guide. Picked us up at the cruise ship dock. Took us to the best stops on Mt Etna. Was flexible so we skipped the shopping and spent time at a wonderful winery on our way down from the top of Mt Etna. Very knowledgeable. We were able to learn a lot and we parted as friends. Highly recommended!! Simon lost a star in his rating for his initial reluctance to meet us at the port at 7:30 because of parking when actually there was plenty of parking. He wanted to wait until 8 to pick us up because that was when the archaeological park in Siracusa opened. BUT it was not our intention to visit there We had to talk him into following our desired itinerary, Noto first and then some parts of Siracusa later. Thankfully Simon as driver brought along Biaggo as our entertaining and highly experienced guide. Simon is so knowledgeable and nice. We enjoyed the tour and our time with him. Simon picked a great place for a local lunch - it was fabulous. One of us forgot our phone and he came all the way back to drop it off. Simon is an excellent tour guide for Taormina and Catania. He is professional, knowledgable, personable and flexible, even adapting to our schedule by including a visit to the hill top bar where The Godfather was filmed. We had an outstanding day thanks to having Simon as our guide. Simon B was a terrific guide. He is an excellent driver and made all of the arrangements for private guides on site and picked a great restaurant for lunch. He was able to share the history of Sicily and of each site with us. We had a person in a wheelchair and he made sure she was comfortable and brought us to areas that accommodated the wheelchair. I highly recommend Simon B as he is very professional and the tour, while long, was excellent. We had a nice day with Simon. The Godfather tour was everything we had hoped to experience. Traffic was bad due to an Italian holiday and I think had we chosen a group tour (with the associated long stops) we would have missed something. Simon was able to navigate around around traffic and get us to all the sites we wanted to see. Simon was a fantastic guide. He took us on tour to small town where grandmother was from. Talked to several natives trying to get into records on a Sat. Invited into home to discuss parentage. Arranged email for future info. Even got someone on the phone from nearby town trying to get into records. Too bad it was Sat. Then gave tour of Cefalu and suggested restaurant where we had great dinner overlooking water & sunset. Spent entire day with us. We highly recommend him! Simon was always eager to please us. The guide he contracted for Tindari was very helpful. He treated us in Valleta with the famous dessert made of crunchy pastry filled with ricotta cheese, cannoli. I have to say this was probably the best tour with the best guide I have ever been on. We hiked on Mt. Etna which was amazing, went to the winery-which had amazing food, and so much more. Simon was informative and really a great guide. I had the best day! Simon was the best guide! He was very flexible when our cruise line changed our port. We were able to taste and tour 3 separate wineries. Planeta was by far our favorite. Each winery gave us a tour of their grounds, educated us on their history and how they make the wine. Cottanera made us a delicious lunch that we still dream about. While driving between wineries, Simon told us the history of the island. He stopped to allow us to take pictures. We were back to the boat with plenty of time. Thanks, Simon! Outstanding professional tour guide. Extremely competent driver with consideration of his guesrts. His knowledge of Italian history is so very informative coupled with local knowledge. Arguably one of the most polite and efficient tour guides in our experience. We highly recommend Simon and are assured that he would meet ones expectations. Simon was amazing. He was a wonderful guide and driver. We will definitely use him again when we return to Messina! Simon could perhaps be an excellent guide if he would give his full attention to his guests rather than constantly talking and texting on his cell phone with one hand while driving his guests around hairpin turns and narrow mountain roads with the other. When we asked him to stop, he explained that he was using his phone so much for his business handling 4 other guides/drivers (apparently in his employ). We ended our planned 6 hour tour 2 hours early because of his inattention to us vs his phone. TOUR GUIDE RESPONSE: Dear Tom, I understand the inconvenience I caused you and I deeply apologize. I agree with your comments, I answered the phone twice without my hands free headset just because I lost it that day. I will like to refund you for the lost 2 hours and to apologize for my lack of attention. I will be glad to assist you next time you come to Sicily. Best. 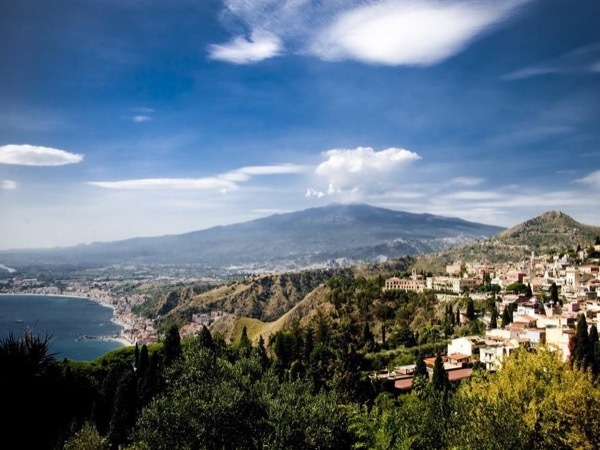 We had a great time touring Taormina and the hillsides of Mt Etna with Simon. He met us at the ship's dock on time and delivered us back according to our schedule. Simon recommended a wine tasting and lunch at a lovely winery which was wonderful. We enjoyed his stories about the Italian life in Sicily. We even saw a lava flow area in the mountains. Our driver was quite good. He was not, however, the guide we contracted. We never received an explanation for the change. Simon was very informative and provided us with a tour that we would not have gotten through our cruise ship. We all enjoyed the tour and appreciated his inside knowledge of Sicily. Simon was a wonderful tour guide! Our drive up to Mt. Etna was breathtaking, walking around the craters while fighting the wind was truly and experience, and the winery was very good. Simon was professional, friendly, and took lots of pictures of us! A great day in a beautiful country! We had a short time in Messina when our cruise ship stopped and the tour with Simon was a perfect way to see the area. Simon is a wonderful guide; both knowledgable and professional. He adapted to our schedule while making sure we had time to enjoy our visit. This guide was not exactly up to the caliber of the others we have used before with TBL. His English was of medium understanding and he was not able to drive and explain areas as we passed or answer our questions . Hr provided us a wonderful very knowledgeable guide in Agrigento that we may not have secured otherwise. Perhaps it was a misunderstanding on my part, but I thought he would be a better guide along with being our driver. It was very difficult to hear him and understand him as we traveled . TOUR GUIDE RESPONSE: Thank-you for your time and effort in writing your review. Your feedback helps me understand the quality of service I am providing and whether or not I need to improve. I am sorry that you did not feel my tour was 5 star. I was not myself on your tour date and rather than cancel, I wanted to still assist you as best I could. I apologize I was not 100% and I will keep your comments with me for future tours. Late in rating - sorry. Good service and very helpful us in the two sites that we wanted to see. Would use this guide again. Simon is very a responsible guide and has endeavoured to make our trip as much pleasant as possible and cater for what we needed. He is also very helpful and drove us to our requisite site, Santa Cita, which is not included in the itinerary. We absolutely enjoyed our day with Simon. He was a knowledgeable, entertaining guide who very carefully paced the tour to our needs and desires. His van was clean, comfortable and he was an excellent driver. He gave us an enjoyable oversight of Messina, Etna and Tauromina. Simon is very accommodating, funny and flexible. We did not get to the Godfather's village due to very heavy traffic congestion but were taken to other lovely spots around Catania (at our request). Simon was an enthusiastic guide who dealt well with the adversity of a rainy day and a van with brake problems. We had a little difficulty understanding his English, and he even went the extra mile to engage an additional guide for us. We appreciated his helpful attitude very much. Difficult to understand in English. Did not understand our questions an often responded with a "canned" statement, most times unrelated to the questions. Very repetitive. TOURSBYLOCALS RESPONSE: We have reviewed this case with Simon. The guide has acknowledged his error, we can confirm this is out of character for the guide and his other reviews show this. As per the guides request, the customer has been refunded in full for this experience. We spent six days touring Sicily with Simon and would highly recommend him to anyone that is interested in booking a tour with him. His driving was superb and was very attentive to our needs. Do not hesitate - book with Simon! Simon was fabulous. He was very professional and had a great sense of humor. There were some unexpected problems with members of the group which he dealt with deftly and charmingly. Despite heavy traffic he managed to take us on a great tour. Those of us who made it to the end thoroughly enjoyed ourselves. Simon was one of the most competent guides that we have had. He is polite and thoughtful and willing to help in any way needed. He is a true professional. We are lucky to have met him. We did the Godfather tour with Simon. Simon was incredibly nice and helpful and gave us a wonderful tour. Not to be missed! Simon was great to work with and exceeded our expectations. He was very knowledgeable and was very attentive to our needs. There were 4 in our travel party and he made sure each of us was having an enjoyable tour. When he spoke he called us by our names, very impressive. He spoke glowingly of the locals and life on Sicily. The only way to go. Would highly recommend this tour and would use him again in the future. Simon was an excellent tour guide through the countryside of Messina and Taormina. We especially enjoyed his commentary and thorough knowledge of the places we visited. We highly recommend him and this tour to anyone who is a fan of the Godfather films. What a great day we had with our tour guide Simon. He took us to a beautiful vineyard where we also had lunch. The location was breathtaking. He made us very comfortable while driving and was full of information. This excursion required services by other providers. However Simon helped us with them. Example, we had to take a cable car. He stood in line and purchased the tickets for us. He also showed us other things beside Mt. Etna. You could tell he really wanted to be helpful. Simon was excellent. His guide Biaggio was great very knowledgeable about Siracusa, answered all my questions. Simon was everything one would want in a guide, knowledgeable, attentive, great driver on narrow twisty roads. We had a perfect day with him. Our driver/guide Simon was perfect for us. He was always on time, in tune with our particular needs and interests, and made our visit to Sicily most enjoyable. His sedan was comfortable and well maintained. We enjoyed his company as well as his services. Our Godfather tour was very interesting and seeing the places where scenes in the movie were shot and the history of how the these locations were picked was a true delight. Had a great local meal at the base of Taormina overlooking the small bay. We enjoyed the quick trip to Taormina and just getting to enjoy the beauty of Sicily. We ended the day with a panoramic tour of the main sites in Catania. Thanks for an enjoyable day in Sicily. We had Simon as our guide for our tours, and he is absolutely delightful. I would most definately give him 5 stars. I wouldn't hesitate to go with him again in future, and I would highly recommend him as a tour guide. Simon was fantastic! He accommodated our every want and need. My wife walks with crutches so he drove as close to everything as he could…and sometimes I think he drove closer than he was really supposed to. He also took the time to get to know us and what we liked and didn't like and altered the tours accordingly. He even took us on an unplanned tour stop that was amazing. He also made stops to allow us to take pictures of the very beautiful scenery. If we ever go back to Sicily we will definitely him. Good tour with fun stops at behives and honey tasting. He answered every question and kept the drives between stops very interesting. He was a very fun tour guide and I would recommend him to everyone. Simon had planned a day custom-tailored to suit our interests and pace, and he deftly modified the itinerary as circumstances required, with our input. He was very personable, is fluent in English and an EXCELLENT driver, and knows the roads and sights we visited very well. The restaurant he'd pre-arranged for our meal was excellent, which added to a very educational and enjoyable day. TOUR GUIDE RESPONSE: Dear Brian and Cathy, I hope this email finds you well. Thanks for your review, I am very glad you appreciated the service delivered. It was my first approach to TBL, and I made all my best. I am looking forward to see your movie at the earliest. All the best, Simon B.